At the intersection of Tenth Street and Sixth Avenue, on the site of a former market and fire tower stands Jefferson Market Library. Built in 1877, the library may look like a fairy-tale castle, but it was originally a courthouse where some of the most famous murder trials in the city’s history took place. (In the basement, you can still see where the prisoners were held before they faced the jury!) Next door, on a plot of land that’s now a garden, stood a prison. 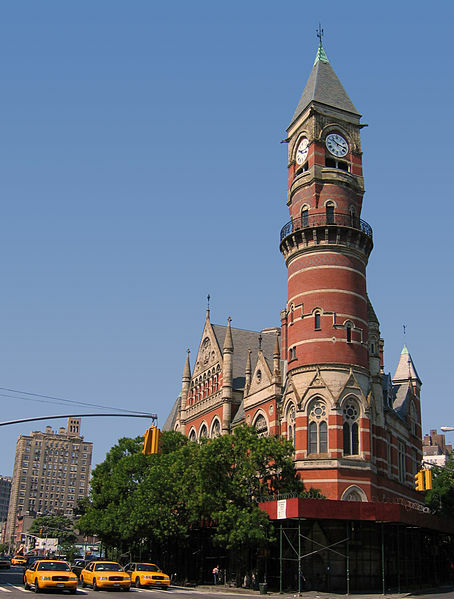 If you're planning a trip to New York, be sure to check the library's website--if you're lucky, you may be able to enjoy a tour of the building's famous tower! And if that's not enough, they regularly host teen author readings (and the NYC Teen Author Festival in March)! Some of the biggest names in teen fiction take part in the readings and festival. Would a criminal library be one that takes your books and doesn't return them?